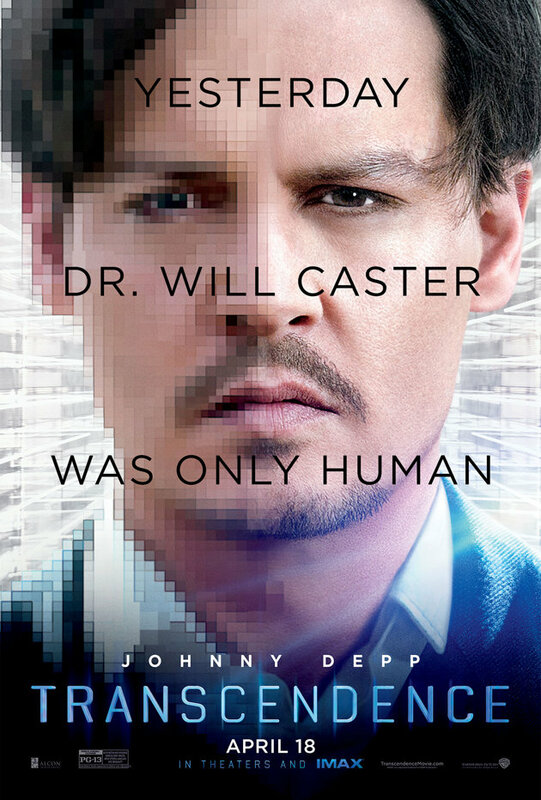 Synopsis: Dr. Will Caster (Johnny Depp) is the foremost researcher in the field of Artificial Intelligence, working to create a sentient machine that combines the collective intelligence of everything ever known with the full range of human emotions. His highly controversial experiments have made him famous, but they have also made him the prime target of anti-technology extremists who will do whatever it takes to stop him. However, in their attempt to destroy Will, they inadvertently become the catalyst for him to succeed—to be a participant in his own transcendence. For his wife Evelyn (Rebecca Hall) and best friend Max Waters (Paul Bettany), both fellow researchers, the question is not if they can… but if they should. Their worst fears are realized as Will’s thirst for knowledge evolves into a seemingly omnipresent quest for power, to what end is unknown. The only thing that is becoming terrifyingly clear is there may be no way to stop him. Review: Transcendence is Wally Pfister’s first directorial outing after a good number of collaborations with Christopher Nolan as his DP, and it’s clear to see that Nolan has made more than an impression on Pfister’s directorial style – it’s almost as though Pfister had morphed into a Mini-Me version of Nolan, except without as much directorial flair. Pfister had set out to make a weighty, cerebral sci-fi movie in the mould of Inception, but the end result is more heavy-handed than weighty, more befuddling than thought-provoking. While it starts off intriguing and tries its best to captivate the audience, the movie sags under its own overplotting, eventually imploding in a most spectacular fashion into a hole-ridden, completely unbelievable denouement, after going nowhere with its plot for more than an hour. There are certainly things to like about Transcendence – the film is handsomely shot (on 35mm film no less), and both Rebecca Hall and Paul Bettany do a good job of being the focal points for much of the movie. Paul Bettany in particular turns in a particularly heartfelt performance, and becomes the emotional centre of Transcendence, and though it is definitely not intentional, Bettany becomes the person to root for in the film, eclipsing Rebecca Hall despite her continual presence. The technobabble is at least interesting for the first few reels, and the film does try its best to make a point about the over-reliance on computers and technology that plagues all of us these days. However, for every positive aspect, negative aspects abound. The leading name on the poster may have been Johnny Depp, but he disappears for most of the movie, and given that he is playing an AI version of himself, it perhaps can be forgiven that his performance is flat and uninspired. The same goes for the rest of the supporting cast apart from Hall and Bettany, who are given nothing much to do except be devices for exposition. Even the usually great Morgan Freeman fails to impress, and that’s when you know something has gone awry. Transcendence also makes the fatal flaw of trying to be smarter than the audience, but then actually not following through on the attempt. It’s immediately apparent – the movie is told from a flashback perspective of Max Waters, which essentially gives the ending away in the first five minutes. Usually this would mean that the movie has another reveal up its sleeves, but that’s not really the case in Transcendence, which leads one to question why the narrative structure was picked. And in the second half of the movie, where nanotechnology plays a huge role, the script time and again requires audiences to fully suspend their disbelief and to accept the proceedings at face value. The technology is absurd, and the logic is nonexistent – this may be acceptable in a typical Summer action blockbuster, but not in a movie that’s trying so hard to be an intellectual one. It’s ineffective and rather insulting to the audience to be quite honest, especially given how the plot eventually writes itself into a very tight corner, and then plods to a long-expected but illogical conclusion that the audience has already (literally) seen coming from the start. And true to the shared DNA with Christopher Nolan, Pfister chooses to end off the movie with one final shot that is open to interpretation, much like Inception – the only difference being that I was absolutely not vested to even attempt any interpretation. Transcended, this has not.